"Nervex is an odorless cream applied to your hands and/or feet to work on repairing damaged nerves for long-term relief of neuropathy. The types of damage caused by vitamin deficiencies, alcohol abuse, and diabetes are best addressed by application of Nervex cream. Using Nervex cream is a safe, natural way to address vitamin deficiency with measured doses from our airless dispenser. Rubbing the easily absorbed, odorless lotion on your feet or hands makes daily use of Nervex an ideal way to get all the Vitamin B12 you need. Natural ingredients assure this lotion is gentle to your skin." I was a sent a 1.7 fl oz bottle of the Nervex Neuropathy Pain Relief Cream from Vita Sciences to review. The price for this bottle is $19.95. Shipping is free with Amazon Prime. This pain relief cream was sent to me in perfect condition. There were no dents, defects, nor issues during shipment. The bottle is made of plastic and measures 4.75" x 1.5" at its widest points. The product is applied by using a pump dispenser. The bottle is white, with orange and yellow accents. The front of the box labels the product, brand, and sizing information (including the measured amount of dosages). The back of the box is where you will find what this product does, active ingredients, other ingredients, directions, and contact information. This is made in the USA. Both the right and the left sides of the box are identical-- labeling the product and brand. The top and bottom do as well. This pain relief cream had a nice safety seal with a perforated strip. It was easy to open. ...as well as the right and left side of the label. This product uses a pump dispenser with measured doses. Everybody has heard of oral supplements and possibly even liquid ones. But what about cream ones!? The set that I received from Vita Sciences is the first that I've used, and I love them! See? I told you that I had more coming! This is the fourth one-- the pain relief cream. Pain relief cream is something that I use every single day of my life, so finding a good one is always a plus! The box holds the bottle well. It was the only thing included in the box. The cream itself is pink in color. It is a very soft and light cream. I love the color. I apply this on my back, and it's like no other cream that I have used before. It applies so evenly, and it's very fast-absorbing. As soon as I apply it, within a few seconds I feel it working. It really, really gets down deep in the muscle tissue. It almost has a 'prickly' sensation, but it doesn't hurt. I actually don't mind the feeling. C'mon now-- no pills, liquids, shots, etc! I'm really liking all of these creamy supplements that are administered topically. They are so easy to use, and you actually want to use them. I don't think I'll ever go back to the oral supplement, because these work just as good, if not better. I highly, highly recommend them. This particular pain relief cream is excellent. It works really well, and I feel the pain melt away within minutes. 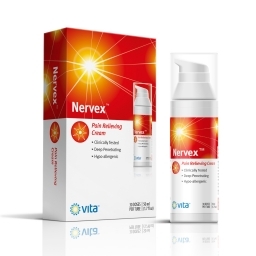 Are you wanting to try the Vita Sciences Nervex Neuropathy Pain Relief Cream, too? Click the link below, and order away!